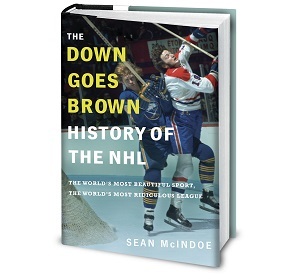 Down Goes Brown: How long will the western reign of the Kings and Blackhawks last? How long will the western reign of the Kings and Blackhawks last? Stop me if you’ve heard this one: The Los Angeles Kings and Chicago Blackhawks are locked in a battle for Western Conference supremacy, with the winner heading on to play for the Stanley Cup. Oh, right — you have heard that one, because this year’s Western Conference final is a repeat of last year’s matchup. It’s also L.A.’s third straight trip to the final four, and Chicago’s fourth in six years. The two teams have combined to win the last two Stanley Cups, and three of the last four. And with all due respect to the Rangers and the Habs, the winner of this year’s series will likely be a solid favorite to take home the championship yet again next year. There sure seems to be a pattern developing here — a two-headed Western monster that isn’t leaving much room for other contenders. That’s not good news for teams like the Blues, Sharks, and Ducks, who’d like to think of themselves as having legitimate Cup chances. And it’s especially rough on teams like the Avs, Wild, and Stars, who seem to be on the verge of breaking into that group. As for teams like the Oilers, Flames, and Predators — well, they probably feel like they should just give up now. But hold on. After all, this is the NHL, where fortunes can change quickly. All hockey fans need to do is take a look at the Vancouver Canucks to see how quickly an elite team can crumble. If you’re a fan of a Western Conference team, maybe there’s still hope. So let’s take a deeper look at how the Hawks and Kings got here, and whether we can find any signs that they’re on the verge of letting somebody else have a chance any time soon. Let’s start with the easy one: Both of these teams have a ton of really, really good players. I know, that’s not exactly breaking news. But the Kings and Blackhawks aren’t just stacked with talent; they’re stacked with talent in remarkably similar ways. Both teams are built around a top two-way center, with Chicago captain Jonathan Toews getting some recent “best player in hockey” talk and L.A.’s Anze Kopitar not far behind. Both players are surrounded by a very good top six, with the Kings boasting big names like Jeff Carter, Marian Gaborik, and Mike Richards, while the Hawks can send out an even better trio in Patrick Kane, Patrick Sharp, and Marian Hossa. Both teams feature a stud defenseman anchoring the blue line (Chicago’s Duncan Keith and L.A.’s Drew Doughty), both have a very good no. 2 defenseman who could be a top guy on many teams (Brent Seabrook and Slava Voynov, respectively), and both supplement that top pairing with a solid complement of supporting pieces. Then there’s goaltending. In Corey Crawford and Jonathan Quick, each team has a solid goalie who seems to elevate his game in the playoffs. We’ll leave that “seems to” in there since there’s always the risk that playoff sample sizes can be misleading — but both guys have been excellent again this year, and it’s fair to say both teams are very comfortable with their goaltending when the games start to matter. So, yeah, both teams have deep rosters featuring plenty of great players. After all, that’s what you’d expect from a pair of Stanley Cup contenders. But if you’re a Western Conference team hoping the Kings and Hawks will come back to the pack over the next few years, the depressing parts come next. And in fact we’ve already seen that scenario play out with one of these teams. When the Blackhawks won the Cup in 2010, they were forced to part ways with a big chunk of their roster, including good players like starting goalie Antti Niemi, defenseman Dustin Byfuglien, and forward Andrew Ladd. It was exactly the sort of enforced parity that hockey fans had been promised under a cap system. And all of that kept the Blackhawks from the ranks of the elite teams for … two whole years. They’d win another Cup by 2013, and now they’re on the verge of yet another. And looking ahead, they’re not exactly in bad shape for next year and beyond. There is no doubt that the Hawks & Kings are great teams, but to think that there weren't at least 4 other teams who could have been in the Western Conference Finals this year and couldn't represent the West next year is just trolling.